While the editors at Bartlett’s liked it, most people don’t agree with it. In fact, 75% of the American population disagrees with it. That would be cause for concern enough. Consider this, however. 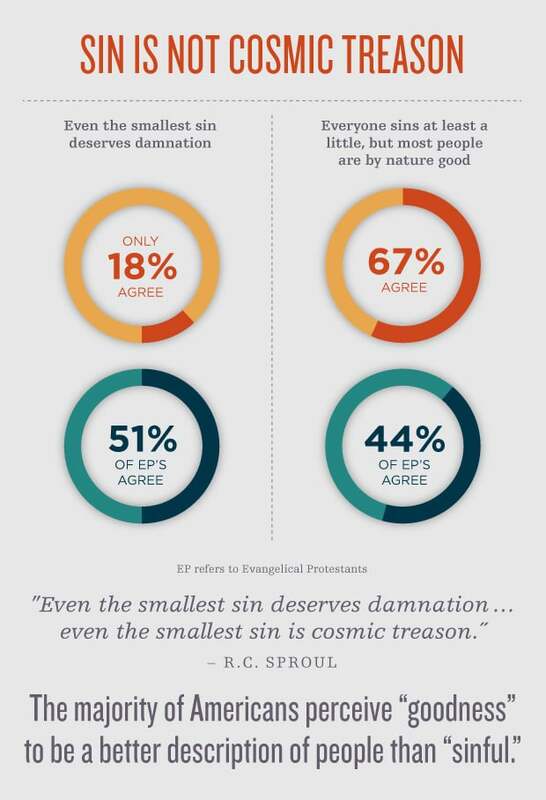 51% of Evangelical Protestants don’t agree that sin is cosmic treason, either. These results come from the survey, The State of Theology. In the survey of 43 questions, four in particular focus entirely on sin and human nature. In addition to rejecting the idea that even the slightest sin is worthy of condemnation, consider also that 66% of the people surveyed think most people are, by nature, good. Of these same people surveyed, 76% think people have the wherewithal in themselves to turn to God and four out of ten think that God loves us because of the good we have done. Not only are these words and rhymes a fitting way to learn the ABC’s of the alphabet, they help us see the ABC’s of the gospel. They also give us a clue as to how to interpret the findings of the survey and these questions on sin and human nature. When we see large masses rejecting the sinfulness of sin, we know that means a number of corollaries. It means that the same masses will have a low view of God. It means that God’s holiness, justice, righteousness, and purity all get eclipsed by muddled thinking. Not understanding what sin is means not understanding who God is. Not understanding what sin is also means not understanding the cross. That’s too weak. To deny that sin is cosmic treason is an affront to the cross. We need to pay attention to two questions in the survey regarding human ability in light of sin. Of the people surveyed, 76% think that people have the ability to turn to God and 40% think God loves them as a response to their goodness and the good things they have done. If that’s true, why did God send His only begotten Son to die on the cross for our sins? Martin Luther did not have a survey like this at his disposal. But, he knew the human heart. In one of his most important texts, the Twenty-Eight Theses for the Heidelberg Disputation (1518), Luther addressed these issues head on. In the Heidelberg Theses, Luther makes the point that human works, even if “done over and over again,” cannot advance us on our way to righteousness. We can’t take away our sin by striving. In fact, Luther says we only “add sin to sin.” We think we are taking one step forward, when really we are taking two steps back. So should we despair? Can we ever advance to righteousness? Would we be better off to think of ourselves as good and capable of being so good that we earn God’s love? “No,” Luther says. We must utterly despair of our own ability, but we cling to God’s grace. We are not left without hope, but we are pointed to the one thing that is our hope: the cross. God did not send His Son to die for the lovely and the good. He did not send Him to make people who are by nature good only better. God sent His Son to die for sinners. And that is good news, because all of us are sinners. If the love of God only found the lovable, we should all despair. Not one of us is worthy, for all of us have committed cosmic treason. We are guilty of rebelling against the Holy One. Regardless of what the survey says, we are not lovely. We are traitors. We have committed cosmic treason. Thankfully, the love of God doesn’t find; it creates. The love of God sent Christ to the cross to die for us. Clothed in the righteousness of Christ, sinners become lovely.